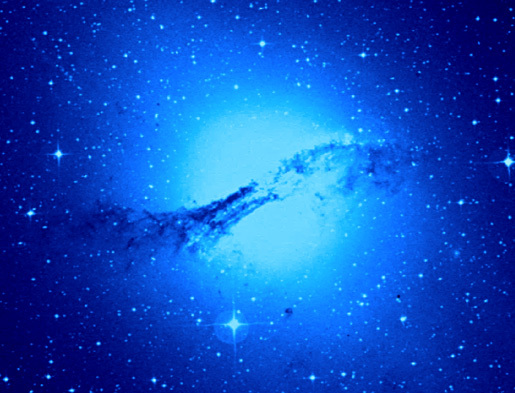 First observed by Chandra in September 1999, Centaurus A was an early demonstration of the spectacular science this powerful X-ray observatory could do. Astronomers continue to use Chandra to study this elliptical galaxy (also known as NGC 5128) that contains a spectacular jet and a core teeming with X-ray emitting sources. 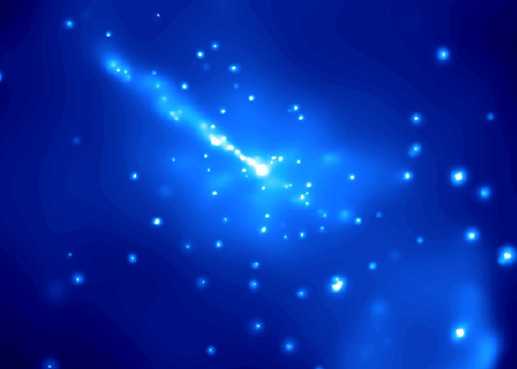 This Chandra image of Cen A shows a bright central source: the Active Galactic Nucleus (AGN) suspected of harboring a supermassive black hole. Chandra also detects a jet emanating from the core and numerous point-like X-ray sources, all bathed in diffuse X-rays produced by several-million-degree gas that fills the galaxy. A team of scientists, led by Ralph Kraft of the Smithsonian Astrophysical Observatory, has begun to study each of these components of X-ray emission from Cen A. The unprecedented imaging resolution of Chandra allows scientists for the first time to clearly resolve each of these distinct components of the X-ray emission for detailed study. Over 200 point-like X-ray sources have been identified and studied in Cen A. Because of their distribution around the center of the galaxy, it is believed that most of these sources are X-ray binaries in which a neutron star or stellar-sized black hole is accreting matter from a nearby companion star. A few may be supernova remnants or unrelated, more distant background galaxies. Comparison of Cen A's X-ray binary population with populations in other galaxies is important for understanding the evolutionary history of galaxies. It is becoming clear that there are significant variations in the X-ray binary populations of otherwise similar galaxies. The reason for this is uncertain, but may be related to differences in the star formation history or mechanisms for the creation of X-ray binaries. The observation of the jet has provided scientists some surprises as well. The X-ray structure of the jet has been shown to be significantly different than the radio structure, and the X-ray jet is much more uneven than originally believed. These results have cast doubts on simple models of how the energetic particles ejected from the active nucleus travel along the jet. The Cen A image was created from Chandra observations taken on December 5, 1999 (35,900 seconds) and May 17, 2000 (36, 500 seconds) with the Advanced CCD Imaging Spectrometer (ACIS) as part of the HRC GTO program. Other members of this research team include Steve Murray (PI), Bill Forman, and Christine Jones (Smithsonian Astrophysical Observatory), Martin Hardcastle and Diana Worrall (Bristol University UK), and Julia Kregenow (Wittenberg University). Scale Image is 10 x 6 arcmin across. Coordinates (J2000) RA 13h 25m 28s | Dec -43° 01' 11"